From Main body of report: This colliery is 120 fathoms deep. It appears that on the day of the accident, after the workmen had been lowered to their work, and the day's output had commenced, that an accident happened to the winding machinery. Various parts of it were broken, and for a time rendered unfit for use. Under the circumstances a scaffold was constructed and attached to the crane rope for the purpose of raising the workmen. I understand that the end of the rope was lashed to the drum of the crane, or fastened to it with white rope, so as to prevent it from slipping. After the necessary operations had been completed, the deceased and a neighbouring workman were lowered upon a scaffold by the crane and rope. In this way they proceeded for 90 fathoms, or to within 30 fathoms of the bottom, or thereby, when suddenly the rope upon the drum slipped, or began to revolve round it, and the scaffold was precipitated down the shaft with considerable velocity. The deceased appears to have lost his balance, as it is understood that he fell to the pit-bottom before the scaffold reached it. The cause of accident was the rope slipping upon the drum. There was a "gland" for the special purpose of securing the rope to the drum, instead of lashing it with rope as above described, but unfortunately it was not used in this case. In practice, such a fastening with white rope is sometimes made, but it is not a safe one. From Main body of report: The deceased was a miner, and the place where he worked was being pushed forward by two shifts in the 24 hours. It appears that on the morning of the accident he had descended with the fireman to commence upon the first shift. The fireman had proceeded to examine a place in the immediate vicinity of the deceased's wall, at least not far distant from it. There was a place defined where the deceased should have remained till after the fireman had completed his examination, but instead of doing this he had gone in during the fireman's absence to his working place, and ignited some fire-damp which had collected in it. Had the precaution of preventing the descent of workmen till after the fireman had made his examination, and signalled to the surface to that effect, been observed, this unfortunate occurrence would have been prevented. From Main body of report: The second fatal explosion was at Milnwood Colliery, within three miles of the last-mentioned place, and which resulted in the death of James Scott and Patrick Slemman. A blind pit had been sunk from the main coal to the splint coal for a second outlet. The mine in the latter coal did not reach the pit for three days afterwards; meanwhile, owing to defective air-courses, fire-damp had accumulated in a mine in the main coal leading to the blind pit, and when the communication was effected this fire-damp flowed down the blind pit, ignited at the lights of the deceased, who were working in the splint coal, and both of them were fatally injured. This fire-damp should have been removed, when the colliers were not in the pit. "It being admitted that the defenders are proprietors or lessees of the pit known as No. 6 pit on the Cambusnethan estates near Wishaw : Whether on or about the 31st day of March 1865 the deceased, Andrew Wilson, the husband of the pursuer, Mrs. Agnes Russel or Wilson, and the father of the other pursuers (children), while employed by the defenders on the shaft of said pit was precipitated to the bottom and killed, in consequence of the breaking of the rope used for raising the workmen to the surface, from defect or insufficiency thereof, through the fault of the defenders, to the loss, injury, and damage of the pursuers." The jury awarded damages to the extent of £176 to Mrs. Wilson, and £50 to each of the four children. The Defendant will also require to pay Mrs. Wilson's law expenses. From Main body of report: This is one of the most painful accidents that has taken place throughout the mines of this district for a number of years. The deceased (three of them) were young lads about 16 years of age each, and they worked with their parents in one of the usual working places of the pit. 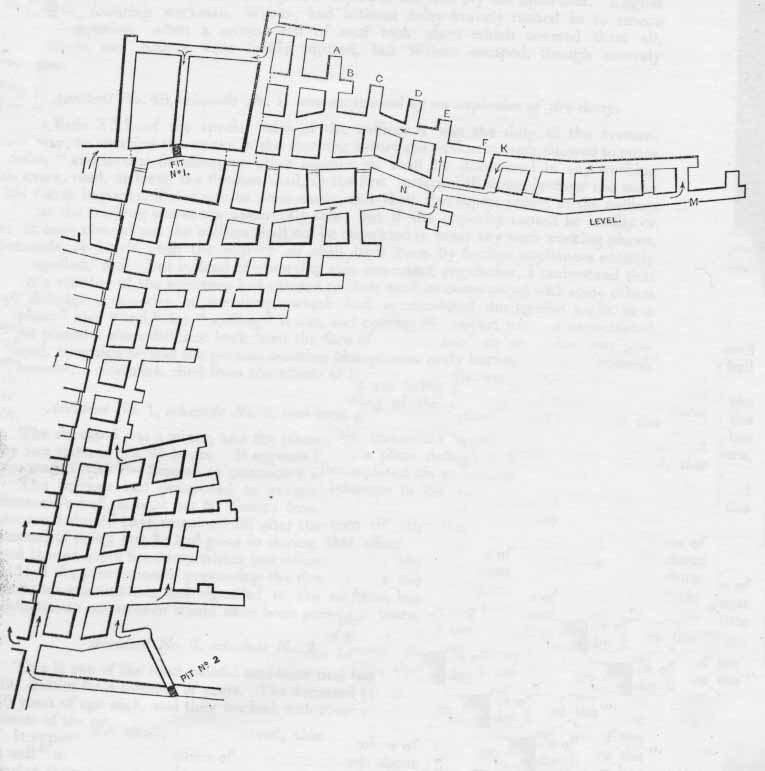 From Main body of report: This pit is of the form peculiar to Scotland; there are two divisions separated by a partition of wood, and these are fitted with guide rods and cages for winding purposes. On the day of the accident, and a short time before it took place, I understand that the guide rods in the dip end of the shaft had got partly displaced, so much so that work was wholly suspended in that division. It appears that as soon as the winding apparatus had been got disconnected from the cage in the dip end that the necessary preparations were made for the workmen to ascend in the "rise" division. The contractor, who was in the pit at the time, ascended first with one of the workmen, it is alleged, for the purpose of examining the "rise" end, so as to make sure that the displacement or derangement in the dip end did not extend to it also. It does not appear that they discovered any defect; they were safely raised, and the cage was returned in the usual way for the workmen to ascend. Eight " loads" of men were drawn up after the manager made his examination, and the bottomer and his two companions were the last of the workmen requiring to be raised. The accident happened while they were in the act of being drawn up, about 18 or 20 fathoms from the bottom, by the cage being drawn partly out of the guides. The person who descended first after the accident to get at the cage found it entire, but out of the guides; he put it into its place and was drawn up with it to the surface. The cage being very little out of place, not more than four inches at the extreme point, it is difficult to understand how three persons could fall away from it. I am inclined to think that under the excitement they must either have been attempting to get off the cage by the end of the pit by stepping on to the "buntons," or that one of them had stumbled and got entangled with his fellows and drawn them with him. From Main body of report: The deceased was a collier. His "plane'' had been driven up the length of the "stoop;" it had been standing for about four weeks; occasionally a small quantity of fire-damp gathered along the extreme "rise" of it, and at the time of the accident he was engaged putting over an "end" upon it. No doubt the deceased was acquainted with the state of the "plane;" he had gone into it for the purpose of obtaining an idea of the extent of coal to cut, when in some way his light, which he had left at some distance behind him, ignited the fire-damp, and he was burned. The " plane " was not at the time in the act of extension, and under the circumstances it was the duty of the fireman to place a fence across the entrance leading into it, or to properly ventilate and dispel the gas. From Main body of report: The deceased was the regular fireman for the pit, and it was his duty to examine the workings in the morning before allowing the workmen to enter them. It is supposed that he made an examination of a limited division of the pit on the morning of the accident, and after reporting regarding the state of it, passed on to examine places situated to the " rise" of that division, but disconnected by a dislocation. From the evidence of the workmen, it appears that he had with him at the time an unprotected light and a Davy lamp both burning. It is very likely that he had been in the habit of carrying an unprotected light along with him while travelling along the main roadways and other openings considered safe, and using the safety lamp only as he approached the faces, or places where fire-damp was likely to be met with. It is almost certain that on the present occasion he had used an unprotected light imprudently, and from some derangement of the ventilation, by broken brattice or otherwise, he had unexpectedly met with a body of fire-damp. A fireman while making his round of examination in the morning should constantly suspect danger, and as directed by the Special Rules, all such examinations should be carefully made with a safety lamp, and there is no other safe way. From Main body of report: The third accident occurred at the Victoria Pit, Wishaw, the property of the Wishaw Iron Company. The accident happened in the splint coal workings, which were newly opened up, and within a hundred yards of the shaft. There were not 12 men in the seam, and they were all on the opposite side of the pit from that on which the deceased was. It was evident that the explosion had come from the place where he had been working, and had been kindled by him, although in what way is somewhat doubtful. His body was found at his working place, and his Davy lamp was also found there unlocked and broken. From Main body of report: Solesgirth Colliery is 50 fathoms deep. The shaft arrangements are of the usual description. It is fitted with cages and conductors, and the machinery is arranged to pump water and wind materials. McLachlan, who was the reputed oversman, had, on the day of the accident, been cleaning the "sump'' (the bottom of the shaft), and after having finished it he had requested the "bottomer" to make the necessary signals to the engineman to draw him to the surface. Love, who happened to be near the pit-bottom at the time, waiting to be taken up, went on to the cage along with him, and it was raised accordingly. It did not appear that any derangement from breakage of guides or otherwise had taken place in the shaft, and the deceased were drawn up to within a few feet of the surface before anything unusual occurred, when a noise was heard as if those on the cage wished the engine stopped, which was done, and in a few moments after the deceased fell to the pit-bottom, a distance of 45 fathoms or thereby. I made a careful examination of the shaft and fittings, but could not discover the cause of accident. It is an unusual thing for two men to fall away from a cage while being drawn up in a shaft, apparently without any cause, as the cage and winding apparatus remained entire and in working order. Of course there must have been some cause, and probably the most likely was, one of the sufferers got caught by a "bunton," and his neighbour, in attempting to assist him, had in some way got entangled with the shaft fittings, and was dragged off the cage with him. From Main body of report: Robertson, the deceased, was a young lad, and worked along with his father, who was a collier. It appears that on the day of the accident, about 3 o'clock, p.m., that he and his father, along with a number of the workmen, had left off work and were drawn to the surface. One of the drawers had been requested by the hillman to return to the pit-bottom to send up a few more loaded hutches, which were required for some particular orders. Robertson proposed to accompany him ; the drawer got on to the cage and gave the descent signal. On the engine being set in motion to lower the cage, the deceased, who was standing near to the pit-mouth, suddenly attempted to get on to it, but, either by stumbling or missing his footing, fell on the cage and past the side of it before he could be rescued. From Main body of report: The deceased was sometimes employed to assist the fireman Brown, and on the morning of the accident I understand that they were in the act of examining the state of the colliery, when a quantity of fire-damp was ignited at one of their lights. The duties of a fireman are most important, and ought to be performed with the greatest of care. It is understood that his examination in the morning is made strictly with a safety lamp, and when it is considered that the ventilation of a mine is subject to many derangements, such as from damaged stoppings, trap doors partly left open, air-courses partially closed, &c., and from either of which the ventilation may be suddenly diverted, the necessity for such an arrangement will be at once apparent. In the present case I have no doubt that the fireman and the deceased had, contrary to the regulations of the colliery, been making their examination with an unprotected light, when they unexpectedly came in contact with a body of fire-damp. From Main body of report: The workings of this colliery, in the Splint coal seam, situated to the rise of No. 1 pit, are limited; they had been resumed a short time before the accident, and were confined to the places marked on sketch A B C D E F.
It was the duty of the fireman to examine the working places before the shift (a night shift) of workmen were allowed to commence to their work. I understand that the fireman, on the night of the accident, had made his usual examination, and informed the deceased and others regarding the state of the ventilation, in their working places, before they were allowed to enter them. The deceased and his neighbour worked in the " end" F, and with the exception of the "plane" E it does not appear that the fireman had discovered fire-damp in any other working place. It was explained by some of the workmen, that after working or being in their places about an hour, they had met in the " end" F to smoke, or otherwise, and after remaining there for some time, the deceased left them, as they understood, to go round into the place K to "chap the coal," (a customary and rough mode of judging from the sound of the thickness of solid coal existing between two places near to each other,) when shortly after an explosion of fire-damp took place. Two of the workmen state decidedly that the deceased went down the "plane" from them as if he had been going to the place K, and that he had no time to go anywhere else, judging from the time he left them till the time the explosion took place. The fireman asserts there was no fire-damp in the place K when he examined it, and he never knew of fire-damp being lodged in it; and he was of opinion that the deceased, instead of going down the "plane" as described by his neighbour, had gone up the " plane " and into the fire-damp which he had cautioned them regarding at E.
I made a careful examination of the works, and in particular with the view of testing these reports. I could not discover fire-damp between the level M and the place K, and as the opening between these two points along the solid coal formed the aircourse, it is difficult to conceive how fire-damp, at least in quantity, could be lodged at the place K. Assuming that the brattice and stoppings were entire, and judging from the position in which the body of the deceased was found at N, the theory that the fire-damp was ignited to the " rise," it may have been at E, seems to me the most likely one. From Main body of report: The fourth accident occurred in the same pit on the 14th of September, when John Winning was killed. After the previous accident the splint coal workings had stood until pumps were put in to draw the water. The deceased was one of the workmen engaged in putting in the pumps in the shaft. He went down on the cage to the splint coal with a naked light and ignited some fire-damp there and was killed. From Main body of report: According to the regulations of the colliery, the fireman had examined the pit on the morning of the accident, and reported to the workmen regarding the condition of their places. The workings were but limited, and the level to the west of the pit, and an "end" off it, had been abandoned for some time previous to the accident, and it was well known that fire-damp existed in them. It appears that the contractor or person in charge of the pit had arranged with the deceased, Fingland, to commence and work in the "end" off the level above referred to, for the purpose of forming a connexion with a place to the "rise," and thus extend the circuit of ventilation. A pair of "fanners," rather a primitive contrivance, had been constructed at the foot of the "end," on the side of the level, for the purpose of forcing air into it and dislodging the fire-damp. The deceased, Fingland and Brown, and the contractor, were, I believe, the only persons in the level, and near to the foot of the "end," when the explosion happened. The "fanners" had only been in operation for a short time, less than a quarter of an hour. There was no open or unprotected light in the place, the only light used being a Davy lamp. There might have been a difference of opinion as to how the accident happened, seeing that the dislodged gas was understood to pass off in to the return current and clear of any open lights, and in consequence of the strong current of air it could scarcely pass any other way ; but James Fingland, brother of one of the deceased, who commenced to work in the room to the " rise " about a quarter of an hour before the explosion, states that there was no fire-damp in his place when he commenced to work, and this is confirmed by the fireman, that on passing with his lamp on his head, about six feet back from the face of his place, he observed the fire-damp to ignite at it, " flare along the roof,'' and immediately after the explosion took place. As all the other parts of the pit were well ventilated, I cannot think that the contractor did this negligently, but otherwise it betokened a want of judgment. No doubt he expected to dislodge the fire-damp and keep it clear by the action of the fanners, till once a connexion was made with the place to the rise," when of course the circuit of air would be extended. Under the circumstances the proper way would have been to lead a current of air into the abandoned opening with brattice, (which by the way was very much fallen) and practically speaking, there was no other secure way. The contractor, Hamilton, has been severely burned, but apparently he was the only person to blame. operation by the bottomer for the cage to rest upon. The accident was occasioned by the unfortunate sufferer pushing a loaded hutch of coal forward into the pit before the cage was lowered to receive it, and falling to the pit bottom with it a distance of 11 fathoms. Mid-workings are dangerous, and where two seams are worked out of one shaft, if practicable, it should be arranged to have a scaffold over one of the divisions of the shaft, at the upper or mid-working, leaving the other open but fenced off, so as to prevent any person from falling into it. From Main body of report: There were two firemen, Ferril and McLeish, employed to examine this colliery before the workmen were allowed to enter to their work. It appears that these men had been lowered into the mine early on the morning of the accident, and they had proceeded together to a part of the mine where branch roadways led into their different districts. From the explanation of McLeish, the deceased (Ferrie and Yuile, a brusher) parted with him there, and at that time they were carrying open or unprotected lights with them. He (McLeish) went straight in to the working places, not far distant, but had not examined more than three or four of them when an explosion of fire-damp took place; he did not see the flame, but felt the effects of the blast. Judging from the place where the deceased were found, I am of opinion that the explosion took place before they (Ferrie and Yuile) reached the face of the working places. Apparently they had been proceeding with their open lights to a known platform, about nine or ten yards beyond where the accident happened, and where the air was in part split. As the mine in which they were travelling formed the direct and main airway, they must have assumed that the ventilation would be satisfactory and safe, at least to that point, the platform referred to. It scarcely admits of a doubt that they had continued to use their unprotected lights after parting with McLeish, as the safety lamp, which had been trimmed with a new wick, was afterwards found near to them and had not been lighted. Examining a pit in the morning with an unprotected light seems such an absurdity, that were it not for such proofs as the present, it might be doubted whether any person accustomed to mining could be found foolhardy enough to do it. From Main body of report: The deceased were roadsmen. It appears that on the day of the accident they had been engaged making a roadway through a part of the " waste " which had been abandoned for a considerable time. Though the roof at this place was comparatively good there was a thin " ply " immediately above the coal, which generally required to be supported or taken down. The deceased were at the time of the accident engaged taking this part of the roof down. I understand that McMeiken had driven out one of the old supports originally placed to secure it, when immediately after a part of the thin ply fell upon him. August [sic] and a neighbouring workman, Wilson, had without delay bravely rushed in to rescue their companion, when a second fall of roof took place which covered them all. McMeiken and Angus were fatally injured, but Wilson escaped, though severely bruised. From Main body of report: The sinking at this mine had been completed a short time before the accident, and the works were of a preparatory kind, consisting of an exploring mine, with two levels (just commenced) off it. Referring to the sketch, A is the face of the exploring mine, and 13 C are the levels being opened up off it. The ventilating arrangements were simple. The air passed along one of the divisions of the mine, separated from the return by a wall of brickwork. It was directed in to the level B by a screen placed across the return at d, and from that it was returned to the upcast shaft at the pit-bottom. One of the persons injured had, I understand, a contract to drive the levels B C two shifts in the 24 hours. He had two miners and a drawer working in the level C on the morning of the accident, and the shift of men appointed to relieve them had just reached their place, C, a few minutes before the explosion took place. I do not know that the two men who worked in the level C during the night had been aware of any defect in the ventilation, and I understand that their drawer had drawn the materials worked out by them to the pit-bottom in the usual way. While filling the material into the hutches they required to lift or partially open a screen placed in the brick wall at e. From the explanation of the oversman and Kelso, one of the men injured, the screen e was rolled up when they went in at the time the shift should have changed. From Main body of report: By Rule XXI. of the special rules of the colliery it was the duty of the fireman, Ramsav, to examine the works in the morning before the workmen were allowed to enter them, "and in case fire-damp or other impure air shall be discovered in any working place, road, or level, the fireman shall, in the first instance, thoroughly clear the same of such impurity, if that can be done easily, and shall thereupon report to the colliers that the working places are apparently safe; but if the impurity cannot be readily or at once cleared out the colliers shall not be permitted to enter any such working places, roads, or levels until the impure air shall have been by further appliances entirely dispelled," &c. But instead of observing this important regulation, I understand that after a number of the workmen had entered to their work he commenced with some others to dislodge a quantity of fire-damp, which had accumulated during the night in a "plane" and "end," by " wafting" it out, and coming in contact with an unprotected light placed a short distance back from the face of the "plane" an explosion was produced, by which he and the persons assisting him were severely burned, and the deceased, Thomson, a roadsman, died from the effects of it a few days afterwards.